Wide plank flooring has a renewed popularity as people strive to do something different with the look in their homes. It is perfect for the ones who like to experiment a bit with the style of their home. Nobody wants their house to look exactly like someone else’s. The easiest way to give your home a renovated, yet refreshing look and feel without stretching your budget too much is by opting for plank flooring. This style of flooring is available as wide plank wood flooring, cork plank flooring, laminate plank flooring, and vinyl plank flooring. Go wide throughout your home if you are looking for something special. Check out our article: ‘Best Hardwood Flooring’ – complete with reviews and comparisons! When we think of the word plank, we usually think of pirates and walking the plank. But believe it or not, plank can also refer to hardwood flooring too. Plank flooring comes in a variety of widths, all being wider than strip flooring. Plank flooring isn’t just for hardwood floors; it is also available as cork, vinyl and laminate plank flooring. Plank flooring has a very different look from the more common strip flooring style. This means you do not have to change the whole flooring of your house to plan at one time. You can consider a step by step procedure where you install this flooring in one particular area, and after some time, in a different place and so on. This ensures that you have adequate breathing time in between renovations and also, you can sustain the fresh look of your home for a long period of time. As with all hardwood flooring, plank flooring adds warmth, style, and elegance to any home. With the added advantage of being able to choose wider flooring boards, plank flooring can be a very good choice. It’s available in many different varieties including oak, cherry, and pine. Installing pine plank flooring uses the same method as installing strip flooring. Plank flooring varies in hardness, depending on the type of wood chosen. Oak is one of the most popular hardwood flooring varieties with a Janka rating of 1290 for red oak and 1360 for white oak. Whatever type of wood you choose for your flooring, it is important to note that the higher the Janka rating the harder you flooring will be. In most cases, plank flooring can be done yourself without involving any professional. This can save you a lot of hard earned money. 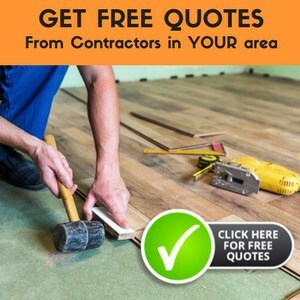 However, in cases where you need to replace part of the flooring with plank flooring, you may have to call in an expert depending on the nature of your previous flooring. Plank flooring has been used since the middle ages and has provided beauty and durability. Wide plank wood flooring was the most effective flooring materials used in colonial times and could be found in the finest country homes. It was not uncommon for these homes to have several different species of plank flooring throughout their homes and using different wide plank wood flooring widths was also common practice. During the 1950s, strip flooring became popular with oak being the first choice in many homes. But in the early 90s, people began searching for more unique flooring and flooring that had a natural appearance. This uniqueness is what plank flooring offers, making wide plank flooring once again a popular choice. The vintage feel it can give to your house is incomparable to any other flooring option available today. Plank flooring is usually 3 or 8 inches wide and contains countersink holes that enable you to secure the planks with wood screws. The holes are filled with wood plugs. Plank flooring can be purchased prefinished or unfinished. As with all hardwood flooring, wide plank flooring will add warmth, elegance and a feeling of space to any room in your home. It is easy to clean and maintain, and if cared for correctly, wide plank wood flooring will last a lifetime. Dusting and vacuuming helps maintain the look and finish of your plank flooring. Furniture glides, as well as mats and rugs, will also help maintain your plank flooring. It is worth noting that water can be detrimental and all spills should be wiped up immediately. Water can damage the finish, and warp your plank flooring. Too much direct sunlight will discolor the wood, and even cause it to dry and crack. It’s advisable to close curtains and blinds whenever possible to prevent UV ray damage. The longevity of this type of flooring ensures that the money you spent on the flooring is a very healthy investment as well. Wide plank wood flooring is very popular in large rooms due to the fact that it gives a more spacious and open feeling. Take away your fear of walking the plank by installing plank flooring in your home. It’s interesting to note that when the colonists first arrived in the New World from England, they began by using oak for flooring, since they were familiar with it from the old country. Pretty soon, they discovered the various species of pine, such as Eastern Pine, White Pine, and Heart Pine. This proved much easier to work with, and became the standard, and an American country classic. Ever since I installed wide plank flooring, I feel much better about the way in which my house looks. It was one of the best decisions ever. Great Article! Our company Morgan & Teach Plank Co made its first floors to model after 17th century hand made flooring planks. We actually hand crafted our first flooring planks. We have encouraged many people to “Walk The Plank” since. In fact that is our key phrase. Today we use modern machinery and manufacture wide plank flooring from a mulitude of species ranging from ash to zebra wood. Our product is prefinished on all sides and stabilized with an all natural VOC free finish. Check out our site http://www.morganteach.com We still offer our authentic hand made plank flooring and it looks nothing like the cheesy hand scraped floors that are floating around today. We believe we make the finest planks on the seven seas! Hi James, I usually delete posts that I consider *advertisements*, but I do believe yours has merit. I like the fact that your finishes have no VOCs. Is your flooring available without being finished — some folks like to finish flooring the way they want. I apologize for sounding like an advertisement but I was excited to see our “Walk The Plank” slogan on another flooring site. To answer your question: An unfinished wide plank floor would not be a “Morgan & Teach Wide Plank Floor”. Morgan & Teach Wide Plank Floors are prefinished and stabilized with our exclusive all natural VOC free finish and proprietary process that impregnates the finish into the pores of the wood. This increases the stability of the flooring planks and gives the planks a deep luster. This process also allows us to make some of the widest floors in the wood flooring business without the stability issues that are attributed to some other wide plank floors. Our factory does make unfinished wide plank floors but we do not sell them under the Morgan & Teach Plank Co. name. We sell this unfinished wide plank under another name.